I had worked several jobs in high school and college. For the most part, having bipolar disorder did not affect my job performance too much until the year before I had to go on disability. When I first moved to Florida to finish up my college degree in teaching, I started working at a movie theater; I enjoyed it because I got to watch free movies and enjoy popcorn and drinks whenever I wanted it. This is where I met my first love. I don’t remember when I told him that I had bipolar disorder or if there were signs of it and I had to tell him. I just know that when he told me that he could never marry me since I had a mental illness, I broke up with him. It was a hard break up for both of us. While working at the same movie theater, I started dating someone who I lost my virginity to. I still regret that. One symptom of bipolar disorder is sexual promiscuity and in that case it was proven true. I never loved him even though at the time, I thought I did. It was his first time too and it was quickly realized that we did not care about each other. I had always thought I would wait until marriage and that was not a reality anymore. Having bipolar disorder can sometimes rob you of so much and make you do things you would never do if you were in your “normal” state of mind. I eventually quit that job. The manager was power hungry and so controlling. Although I liked the job, I was sick of her treating her employees and even customers the way she did. I don’t remember exactly what had transpired, but I probably was somewhat manic as I quit on the spot one night. I just said, “I quit.” and left. That was and is out of character for me. I have never done it before so I really think I was not stable at the time. Unfortunately, I do not remember everything. In trying to write these blogs, it is really make me think. 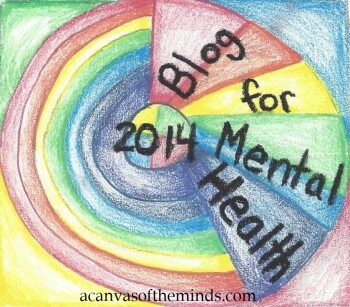 I wrote in my last blog that I get different manic episodes confused and that is true.I also don’t remember everything I did while manic either. While I had this job, I was a full time student. I did have a car payment so I got another job working at a grocery store. While working at the movie theater, I lived at my parent’s house and was renting it out to college students. Eventually, my parents sold that house and and I rented a room in a house. The room was big enough to hold a lot of the furniture from the house. However, when I suspected them doing drugs, I got out of there asap. When I moved into that next house is when I slept with the guy I mentioned earlier. I did not live there very long because she met a guy who moved in. I don’t recollect everything from these times. I know that I struggled with depression and slight bouts of mania. However, I don’t think it was serious until my next move. It seems like I was pretty much stable when I first moved to Florida up until my move into the next person’s house. I must have been acting strangely at some point to break up with the man I loved and/or I was doing strange things. I also know that there were times that I went off my medications. Note:I have learned my lessons with that and although I try to stay on the minimum amount that I can, I know that I need to do everything I can to not get manic. I then moved in with a girl who I went to school with who owned her own house. We had a great time together. I remember going out line dancing almost every night and really liking living there and being her friend. I don’t remember if I told her I had bipolar disorder, but she was soon to find out. That is the next chapter in my life that I will talk about in my next blog. I guarantee that will reveal a lot more of how my bipolar disorder can take over my life. I was in a very severe manic episode. 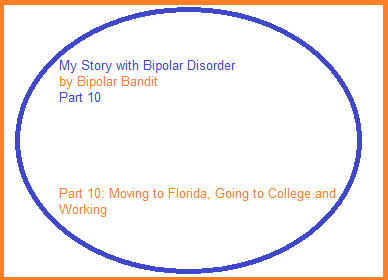 This entry was posted in Uncategorized and tagged bipolar, Bipolar Bandit, bipolar disorder, depressed, depression, manic, stories of people with bipolar disorder. Bookmark the permalink.